Dentists recommend that aside from brushing two times a day, each of us should also floss daily to help keep teeth and gums healthy. Flossing allows you to clean the minute spaces in between your teeth where the bristles of your toothbrush cannot reach. Food can easily get stuck in this area, and bacteria can also thrive here. 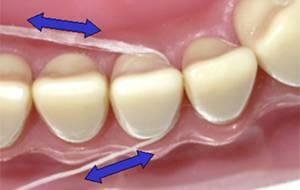 This is also why flossing is also important when it comes to preventing gum disease. There are a lot of other products that your dentist can recommend in lieu of an ordinary floss. These devices can be used by those who have braces, or those who find it hard to use an ordinary floss. You can opt to buy products like the plaque remover, or the flosser. These products can help protect your teeth and gums, but you might want to ask your dentist first before you buy them so you can get maximum protection for your teeth. Always ask your dentist if you have problems with your teeth or with flossing.